Prompted by a recent twitter chat for #ukedchat which examined social media in the classroom, I began to think about just how relevant this is for our Primary schools. Seems straightforward, part of e-safety and online bullying. I have been developing a scheme of work for internet safety here – lots of this can be covered within schools PSHE curriculum. This is an area that will need some work, and the development of social media that children may access makes this all the more important. It can be taught, rote style, as in 'rules', but modelling this with a school account, and teaching them how to make comments can be much more powerful. A tough one. There is no doubt that any access to technology is modelling this, however we have little control over what they can access at home and beyond. Also, we need to have access to this in our classroom, which is often easier said than done! Here we have the notion of 'communication and collaboration' and the idea of 'using technology responsibly' – again modelling the use of social media seems to be key. Do you ask your pupils to contribute online? Do the classes have shared blogs that they use? Do you model how you find information? Ask the pupils what they use? So what, practically can we do in the classroom for these 'social' elements of the computing curriculum and should it include recognised Social Media? I think the key here is that the staff and school have to model how these technologies can be used. If the school team are reluctant, begin by trialling an open 'showcase' type blog (best work blog for example) – or investigate some of the 'education blog' services. Piloting a school twitter account, or a facebook account for linking with authors, for example, can also be useful. Some sharing element can also be useful, for example a school Scratch account, where the children can view others' work and comment on it. Technical support will be needed, particularly if you are finding sites blocked. See my Digital Strategy ideas for more. Is it okay to set homework which involved an online element? How much prior knowledge to parents have? How explicit should home/school agreements be? How much can we expect from teachers? Should updating a homework blog really be part of our PPA expectations? Note, it is no longer about using a computer programme to complete work, but more about the 'connected' – can we expect our children to have internet access at home? The type of Social Media that we use can have an impact too, I recently used the school twitter account to ask Astronauts questions about the ISS. The children contributed these questions to a Padlet on their blog and I tweeted them. Undoubtedly a great use of social media, giving a learning experience they wouldn't otherwise have, and learning how it can be used responsibly. I've used class blogs built on blogger, which the children can leave comments on. We teach them how to leave them, but stress the e-safety aspect continously. It's really important that any issues are dealt with immediately, a responsible adult needs to monitor the comments. Programs which let you contribute and collaborate, sharing a link, can be used to great effect. I've used Popplet (for mapping ideas) and Padlet – but many more are out there. There are plenty of services which offer a closed VLE type of experience, if privacy is a concern, consider trialling one of these. They have their downsides, but many schools still make use of them. 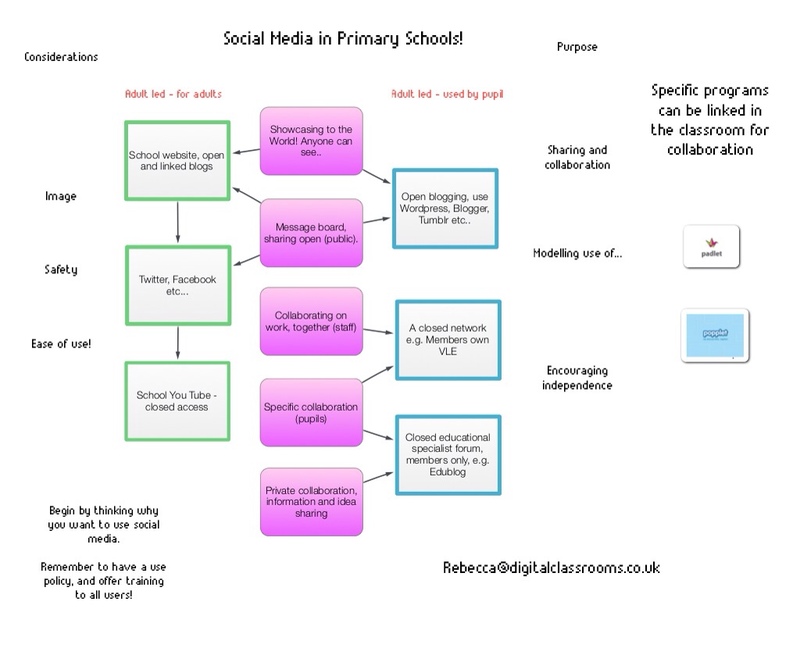 Posted by RS on March 30, 2014 in Supporting Parents, Teaching and Learning and tagged classroom, computing, Curriculum, e-safety, social media.